Amsterdam: Apud Henricum & Viduam Theodori Boom, 1688. Hardcover. Fair. 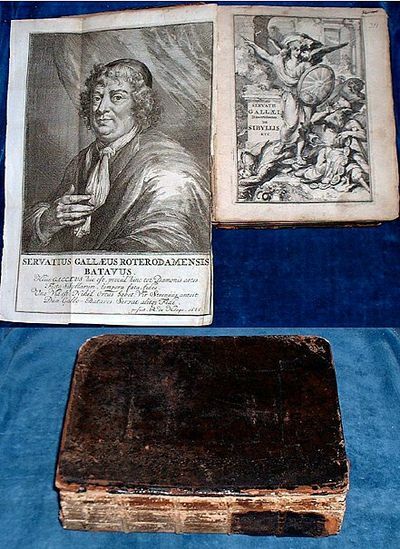 Folding copperplate portrait of Gallé signed R. de Hooge [Romeyn de Hooghe] 1686 + engraved titlepage + 10 of 14 copperplates + a few text illustrations. Quarto contemporary calf tooled lacking most of spine (covers detached/corners very worn). Folding portrait, engraved title, title page + + +658pp +pp indexes. Appears to lack 4 of the plates of Sibyls. Some gatherings coming loose from spine. Text in Latin with brief passages in Greek, some Greek text with parallel Latin translation. *Imperfect copy, in need of binding repair, priced accordingly.